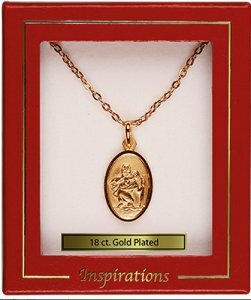 DIRECT FROM LOURDES - 18 ct Gold Plated St.Christopher Necklace. 18 ct Gold Plated St.Christopher Necklace. 18 ct Gold Plated St. Christopher necklace. The gold plated medal is: 3/4" and the gold plated chain measures 18" Chain.